Is Jimmy Kimmel Live! ending? Recently, ABC boss Karey Burke spoke with The Hollywood Reporter about the future of the TV show. 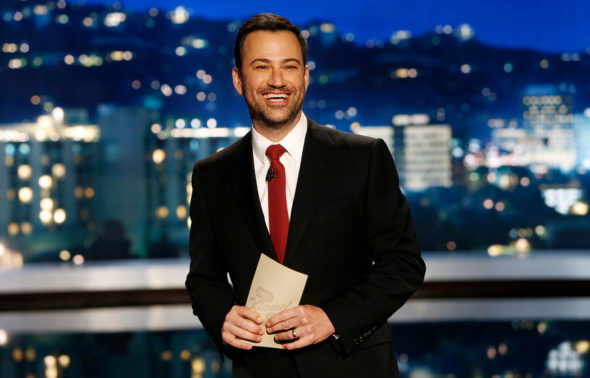 Hosted by Kimmel, the long-running late night series debuted in 2003 and features celebrity interviews, musical acts, comedy, and taped segments. Guests have included Katy Perry, Kanye West, Jennifer Lawrence, Cate Blanchett, Chris Pratt, and Matt Damon. What do you think? Do you watch Jimmy Kimmel Live!? How much longer do you think the show should run? More about: ABC TV shows: canceled or renewed?, Jimmy Kimmel Live, Jimmy Kimmel Live: canceled or renewed? I love Jimmy!!! Keep it roaring!!! Another 20 year’s at least please!!! Quit watching Kimmel when politics began to dominate the show and his hate for Donald Trump made Kimmel unbearable to watch. I used to find Jimmy’s show funny , but now he is so negative and political that it brings me down. I’d be fine if it goes off the air. Maybe ABC could try someone new.